This Handbook presents current and future studies on the changing dynamics of the role of immigrants and the impact of immigration, across the United States and industrialized and developing nations. It covers the changing dynamics of race, ethnicity, and immigration, and discusses how it all contributes to variations in crime, policing, and the overall justice system. Through acknowledging that some groups, especially people of color, are disproportionately influenced more than others in the case of criminal justice reactions, the “War on Drugs”, and hate crimes; this Handbook introduces the importance of studying race and crime so as to better understand it. It does so by recommending that researchers concentrate on ethnic diversity in a national and international context in order to broaden their demographic and expand their understanding of how to attain global change. 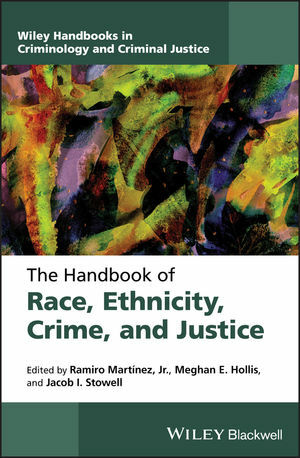 Featuring contributions from top experts in the field, The Handbook of Race and Crime is presented in five sections—An Overview of Race, Ethnicity, Crime, and Justice; Theoretical Perspectives on Race and Crime; Race, Gender, and the Justice System; Gender and Crime; and Race, Gender and Comparative Criminology. Each section of the book addresses a key area of research, summarizes findings or shortcomings whenever possible, and provides new results relevant to race/crime and justice. Every contribution is written by a top expert in the field and based on the latest research. RAMIRO MARTÍNEZ, JR. is Professor in the School of Criminology and Criminal Justice and the Department of Sociology and Anthropology at Northeastern University, USA. In 2011, he was the recipient of American Society of Criminology DPCC's Lifetime Achievement for outstanding scholarship in the area of race, crime, and justice. MEGHAN E. HOLLIS is Assistant Professor in the School of Criminal Justice at Texas State University, USA. She has published in numerous academic journals, including Sociological Focus; Crime, Law, and Social Change; Journal of Experimental Criminology; Security Journal; and Journal of Community Psychology. JACOB I. STOWELL is Associate Professor in the School of Criminology and Criminal Justice at Northeastern University, USA. He received his Ph.D. in sociology from the University at AlbanySUNY. His published work has appeared in Criminology, Law and Society Review, and The Annals of the American Academy of Political and Social Science. Meghan E. Hollis and Ramiro Martinez, Jr.
Amie L. Nielsen, Kristin Carbone‐Lopez, and Ramiro Martinez, Jr.